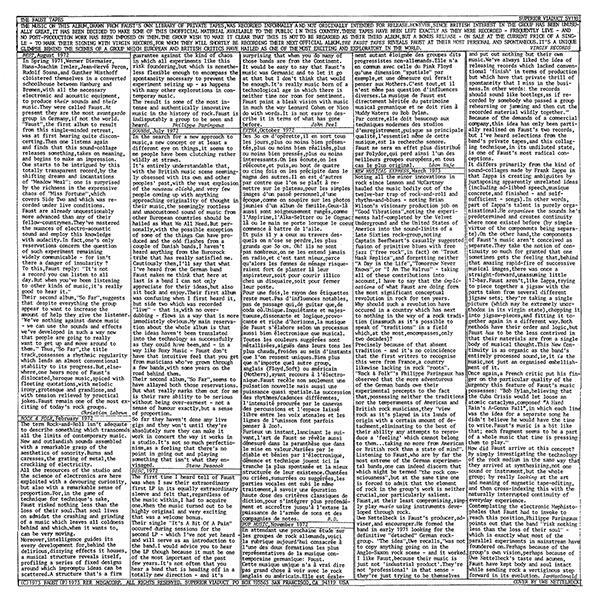 Torna in circolazione in un'edizione in vinile curata dalla statunitense Superior Viaduct uno degli album più leggendari dei Faust, The Faust Tapes, pubblicato in origine dalla Virgin (nel 1973, al prezzo di meno di mezza sterlina) e poi più volte ripescato da Recommended. "The music on this album, drawn from Faust's own library of private tapes, was recorded informally and not originally intended for release. However, since British interest in the group has been unusually great, it has been decided to make some of this unofficial material available to the public in this country. These tapes have been left exactly as they were recorded - frequently live - and no post-production work has been imposed on them. The group wish to make it clear that this is not to be regarded as their third album, but a bonus release - on sale at the current price of a single - to mark their signing with Virgin Records, for whom they will shortly be recording their next official album. 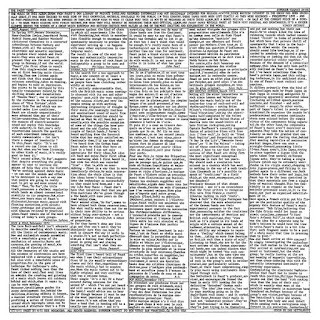 The Faust Tapes reveals Faust at their most personal and spontaneous. It's a unique glimpse behind the scenes of a group which European and British critics have hailed as one of the most exciting and exploratory in the world. Virgin Records".